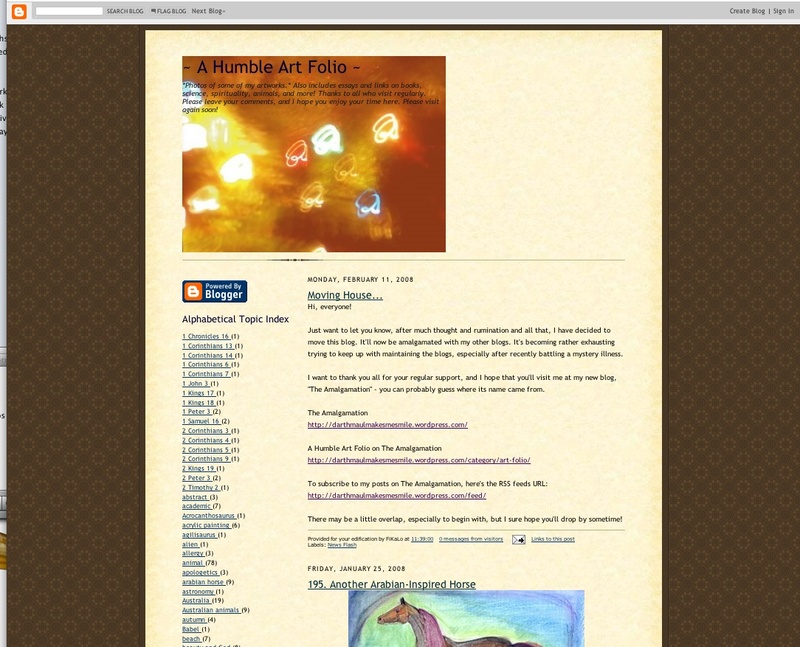 Ah, my beloved blog “A Humble Art Folio” can now be found at The Amalgamation at https://darthmaulmakesmesmile.wordpress.com/category/art-folio/. Well, it did a lot better than expected, developing a regular base of readers. Mostly it was just photographs of my drawings and occasional paintings. Sometimes I would include other things too – a little apologetics here, some spiritual musing there. Mostly, it was a friendly, inclusive little blog. At last count there were 228 posts. The very first post, “To Mermaids,” dated 2 November 2006, can be found at http://fikalo.blogspot.com/2006/11/1-two-mermaids.html.